Whether you’re heading out for a night out on the town or a quick trip to the store, you don’t always want to carry both your wallet and phone. With Presidio WALLET, we’ve combined the two, creating a case that combines superior slim protection with a handy card slot that lets you leave your wallet at home. Building off the popularity of our previous wallet case CandyShell Card, Speck revamped the design to make Presidio WALLET less bulky and yet more protective. The case is thinner at the top, giving it a slim profile with all of the features you loved from CandyShell Card. Inside, the case features the IMPACTIUM Shock Barrier, a band of ridges that suppress and absorb shock on impact, protecting your phone from drops up to 10 feet. 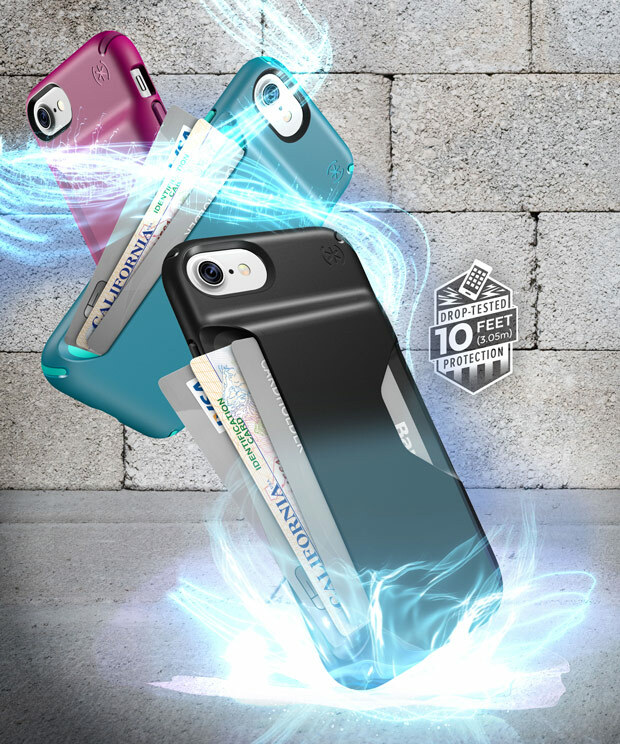 This Shock Barrier improves protection, allowing us to slim down the case. On the back of Presidio WALLET is a card slot that securely holds up to three cards or cash. There’s a thumb release on the right side that makes it easy to get your cards out. When you don’t need them, they stay safe in the slot. Presidio WALLET also features a modern matte finish that resists scratches. It comes in three colors; Black/Black, Syrah Purple/Magenta Pink, and Mineral Teal/Jewel Teal. The case is available now for iPhone 7, with an iPhone 7 Plus version launching before the end of 2016. Pick one up today from Speck’s website.